As the saying goes, "Rome wasn't built in a day," and neither was the U.S. Capitol and its surrounding buildings and grounds. Since Congress first met in the Capitol in 1800, the building has undergone dramatic expansion as the size of the nation has increased. In the center of it all is the U.S. Capitol, surrounded on three sides by congressional office buildings, Library of Congress buildings and the Supreme Court of the United States. The grandeur of each building is enhanced by the use of stone, which has been utilized as a building material around the world for centuries. Stone is one of nature's most enduring materials — a desirable factor when designing buildings intended to last for generations. 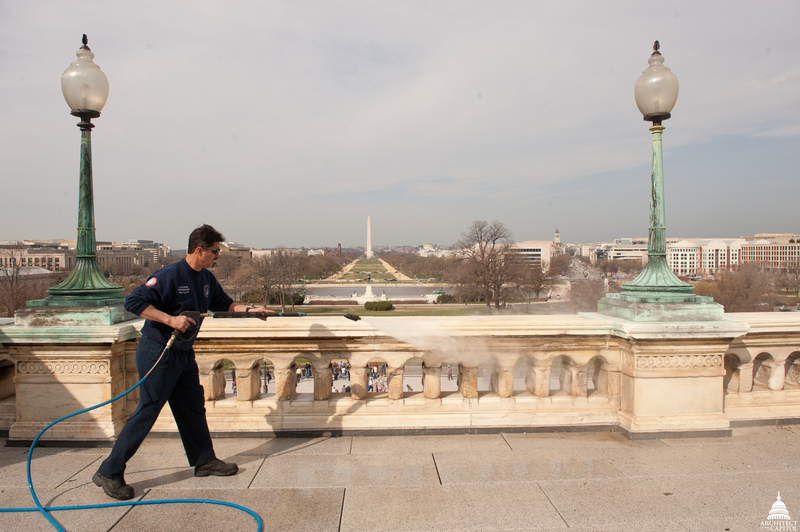 Taking care of the stone that flanks the buildings on Capitol Hill is an evolving and continual challenge for the AOC. The Architect of the Capitol (AOC) is responsible for the preservation and maintenance of the stone exterior of the U.S. Capitol as well as the exteriors of all of the other buildings on Capitol Hill. As the buildings have aged, the challenge of caring for their ornate stone facades has only increased. "Each of the buildings on Capitol Hill was carefully designed and built, and we need to make sure we preserve and maintain what others created for future generations," says Mary Oehrlein, AOC historic preservation officer. A registered architect and a fellow in the American Institute of Architects, Oehrlein has specialized in historic preservation and materials conservation for the past 35 years. She is the second historic preservation officer in AOC history and was hired after William Allen retired last year. While she may be new to the role of historic preservation officer, Oehrlein is no stranger to Capitol Hill. While working in a private practice, she consulted with the AOC on numerous preservation projects, including the preparation of a condition survey and construction documents for preservation of the Capitol’s historic stone and metal surfaces. A primary emphasis for Oehrlein is regular maintenance, a task she compares to preventive medicine. "Properly maintaining the buildings is the best preservation," says Oehrlein. "When we defer maintenance, repairs ultimately cost more and can lead to safety issues." 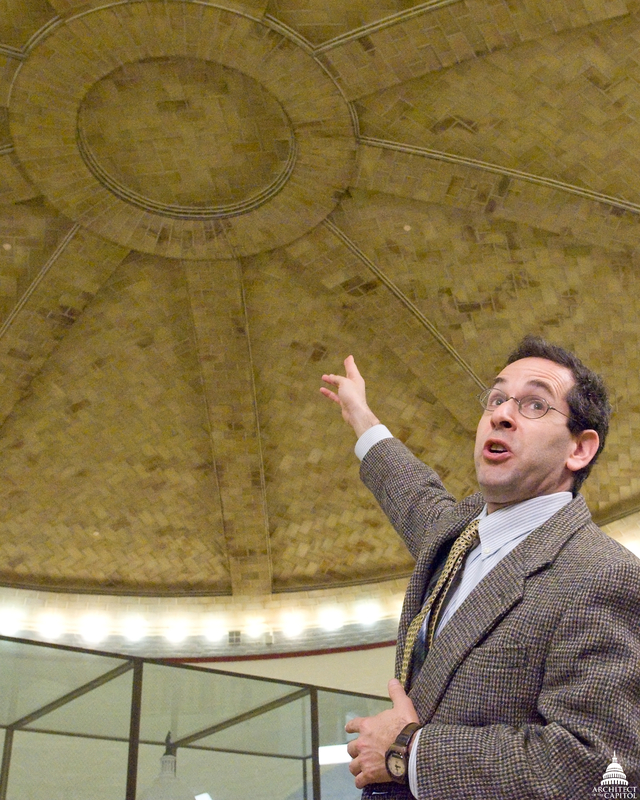 Marty Shore points out some of the unique features of the Guastavino tile ceiling in the Cannon Building's basement rotunda. Marty Shore, AOC preservationist, agrees. "The heart of preservation is maintaining what you have built for as long as possible." To maintain the numerous structures that fill Capitol Hill, Shore has been instrumental in developing historic preservation guides, or building manuals, with easy-to-use information for AOC employees. The guides document a building's history, including a list of the original construction materials and their sources as well as original drawings, major alterations and special preservation challenges unique to each building. According to Shore, "Rain is the main agent that degrades the exterior stone." Over time, defects hidden beneath the surface of the stone can weaken where individual pieces are attached to the building, causing them to unexpectedly break off. Entrusted with the care of the buildings and the safety of all occupants and visitors, the AOC has proactively worked to identify fissures and defects in the stone by conducting stone surveys and removing any stones that appear weak. 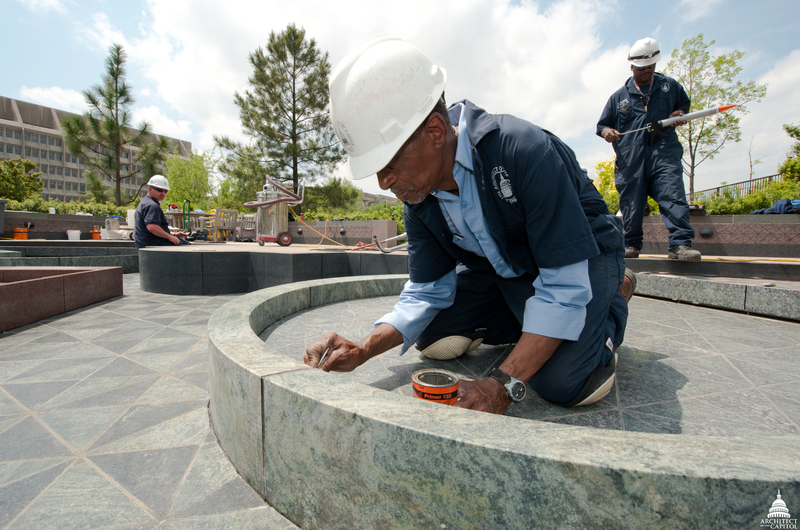 One of the challenges of caring for stone is keeping up with its maintenance. Various techniques are used to preserve stone, such as repointing, a procedure that involves removing the deteriorating mortar surrounding the stone piece and replacing it with new mortar. Come rain, snow and heat, the members of the Construction Division Stone Mason Shop ensure the stone is well cared for. The 16-member crew that makes up the AOC's Construction Division Stone Mason Shop is a roving group, working on projects throughout Capitol Hill, going wherever the need is greatest. "We are honored to be taking care of these national treasures," says Bill Miller, general supervisor for the stone masons. "We take great pride in our work." One of the many projects they have tackled is the preservation of the low Olmsted boundary walls that ring much of Capitol Square. Completed in the 1870s by famed Capitol landscape architect Frederick Law Olmsted, the 5,500 linear feet walls made of granite and gneiss stone were in desperate need of repair. For a number of years, teams of stone masons have worked to cut out the old mortar, reset the pieces and repoint the joints with new mortar. "It's a lot of work to make sure all of the joints line up," says Russell Jones, a stone mason at the AOC for the past 21 years. Aside from hard work, the project also required ingenuity and creative solutions. In order to duplicate the historic look of beading in the mortar, Jones created a custom-made tool to ensure all of the mortar appears uniform. The complex nature of their work requires that the stone masons seek assistance from other AOC shops. If they need a specialized piece of equipment or labor assistance, the shops are always willing to help, making the stone masons’ projects true team efforts. "The superintendents and supervisors also play a big part in what we do," says Jones. "I consider it a privilege to work on these buildings, which will be around much longer than any of us." 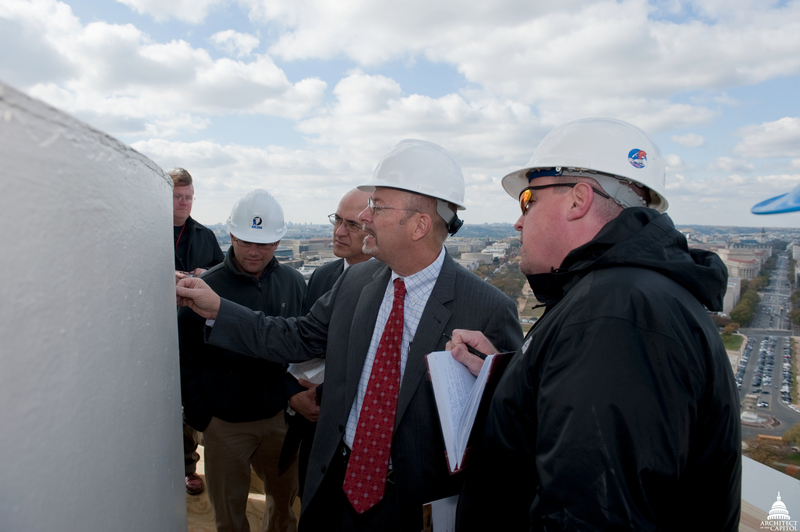 In the fall of 2010, Kevin Hildebrand led a tour of the Capitol Dome improvements, which included caulking and painting work. "Luckily our Construction Division really rises to meet the challenges of preservation," says Kevin Hildebrand, head of the AOC Architecture Branch. An AOC employee since 1991, Hildebrand can attest to their skills, having teamed with the Construction Division on numerous projects throughout the years. In March 2008, he completed a report on the Olmsted hardscape features and annually assists the Capitol Grounds superintendent in determining the sections of the boundary wall that will undergo repair during the summer months. Hildebrand has been involved in many major AOC projects on Capitol Hill, starting with the preservation and restoration of the Thomas Jefferson Building and John Adams Building of the Library of Congress, and more recently, the construction of the Capitol Visitor Center. Hildebrand finds his work fascinating. "It's a real honor to be a part of history." Jim Krapp, the recently retired deputy director of the Construction Division, worked on many AOC preservation projects during his 35 years with the agency. “I've seen a lot of work go on around here, and working on projects was fun," he said, reflecting on his lengthy career on Capitol Hill. "I enjoyed figuring out what was needed to get the job done." He added, "AOC employees care and take pride in their work — they want to serve." Ultimately, the AOC employees who care for the stone used in the U.S. Capitol and its surrounding buildings understand they are helping to preserve history for future generations. The time and effort they put into maintaining the structures will pay dividends in the future when a new generation of Americans come to visit and learn about the Nation's Capitol. This story is also published in the Summer 2011 issue of AOC's Foundations & Perspectives.